First Line: Mormon bishop's wife isn't an official calling. Linda Wallheim is at a crossroads. For most of her life, she's been a caregiver: a wife, a mother to four boys, and a hardworking member of the Church of Jesus Christ of Latter-Day Saints. Now that her youngest son is about to leave the nest, she feels the need to become involved in something that's more for her own well-being than for anyone else's. As a bishop's wife and with her husband's blessing, Linda often plays a part in the lives of ward members who are experiencing problems of some sort, and now she finds herself in the role of amateur detective. A man has come to her husband to say that his wife has disappeared, taking nothing with her-- not even her very young daughter. Linda knows the missing woman and just can't believe that she'd leave her little girl behind. Certain that something's happened to her, Linda begins to investigate. Another woman whom Linda has admired from afar has a dying husband, and as Linda is drawn into this situation, she finds that she has questions about what happened to the dying man's first wife. A young couple is experiencing fertility problems, and as Linda learns more, she senses more to the problem than malfunctioning body parts. Soon she's so immersed in the lives of these people that she draws the concern and disapproval of her husband, but she can't stop. Her conscience will not allow her to. 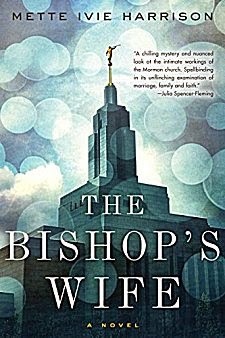 The Bishop's Wife is more a nuanced character study of Linda Wallheim than it is a mystery, although finding out what's happened to these characters is absorbing. As a detective, Linda is as amateur as they come. With each new piece of information she gleans, she changes her mind about what happened and who's responsible. This habit keeps readers on their toes (if not a bit exasperated). Having picked up the author's clues along the way, I was not surprised by the story's resolution, but I found Linda Watching to be a fascinating new hobby. Perhaps the greatest strength of this book is the insight Harrison gives readers into the Mormon faith. To many, Mormonism will seem like entering into a foreign country. In this I had the inside track. I'm not a Mormon, but I lived in Utah and attended Brigham Young University. For me, The Bishop's Wife was familiar territory, and what I liked about Harrison's weaving of faith into this storyline is that she was fair and even-handed. She shares both the good and the bad about this religion, and she does it in the best way possible: by the words and actions of her characters. Do not avoid reading this book because you fear being bogged down by theological rambling. You won't be. Instead you'll be drawn into a story about a very interesting woman whose conscience will not let her stand idly by. Like so many other characters in crime fiction, Linda will not rest until she's found the truth. Cathy - This does sound interesting! I think it takes talent to give insight into a community of people in the context of telling a story. That's not easy to do. Glad you found this a good read. No, it isn't easy to do, and Harrison does a brilliant job.